Don’t be fooled. There is nothing educational about being expelled based on a hearing with little or no due process protections, as is amply documented at the website of the Foundation for Individual Rights in Education (FIRE), where I work. As an alumna, I’m disappointed that Mason is opposing HB 1123. As a legal writing adjunct at the law school, I can’t understand why anyone should not have the active assistance of a lawyer when accused of a crime. 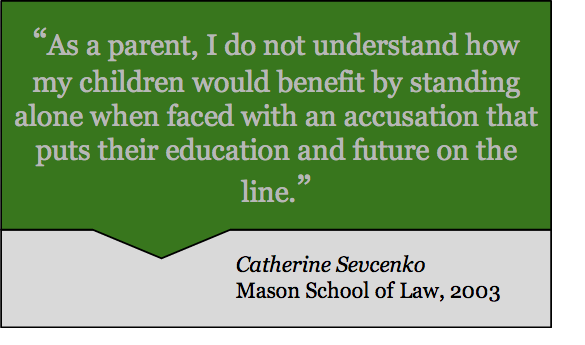 As a parent, I do not understand how my children would benefit by standing alone when faced with an accusation that puts their education and future on the line. At FIRE, I often see cases of colleges unfairly finding students responsible, with devastating consequences. Hearings are flawed and disciplinary panels make mistakes, especially when the playing field is not even. Support HB 1123. Like insurance, you may never need it, but why take the chance? Send all Letter to the Editors to GMUFourthEstate@Gmail.com. 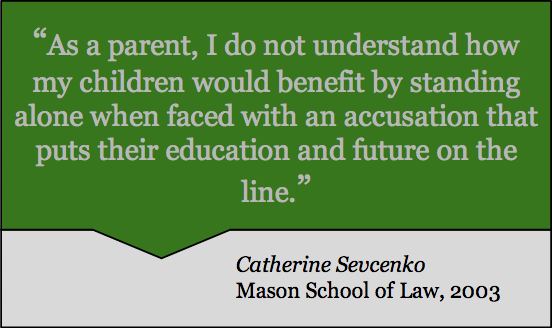 Should Mason students be allowed legal representation during conduct hearings?